A GOAL fest in the final eight minutes of the game turned out for the worst for the Philippine Azkals as they dropped a 2-1 result to hosts Vietnam and crash out of the AFF Suzuki Cup on Thursday at the My Dinh Stadium. With the result, the Vietnamese squad will be going through to the Finals with a 4-2 win on aggregate. 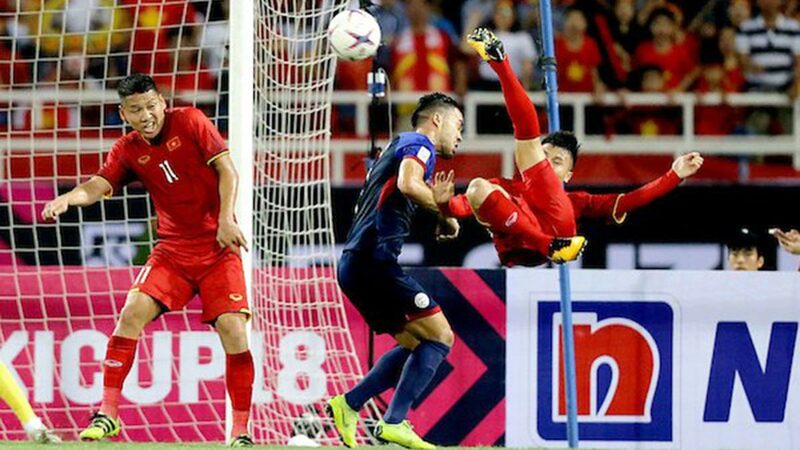 After going goalless in the first 82 minutes, a crazy finish ensued in Hanoi as the hosts scored twice in a five minute span to put formally put out hopes for another miracle in a very significant place in the Azkals' lore. Quang Hai was left unmarked in the 83rd minute to score a breezy goal much to the delight of the home crowd who were already in anticipation of another finals trip. The Golden Dragons then formally put the game away with Nguyen Cong Phuong's solo goal doubling the lead. Substitute James Younghusband pulled one back for the Azkals in the 89th minute but that turned out to be just consolation for the visiting team. Vietnam will now book a Finals date with Malaysia which stunned Thailand in the other semis pairing. That also wrapped up Sven Goran Erikkson's first official tournament as the high-profile Swedish coach brought the squad back into the semis after missing out on the last edition.